One of the applications that is being considered for spacecraft is tourism and transportation. Last week, the U.N. International Civil Aviation Organization called for the development of regulations for space travel in the next five years. The ICAO Council President told an aerospace symposium in Abu Dhabi that his organization, "recognizes that sub-orbital and outer space flights will foster new tourism and transport markets, and that investments in related research and development remain at a very healthy level, " and, he added, "Personally, as an engineer, I am very excited to see the dream and theory of normalized space flight now becoming such a tangible reality." Virgin Galactic is working on SpaceShipTwo which will have two pilots and can carry up to six passengers on a suborbital flight to sixty two miles altitude which is recognized as the "boundary of space." Another aircraft called WhiteKNightTwo will carry SpaceShipTwo up to fifty thousand feet and then SpaceShipTwo's engine will kick in to carry the passengers up to the edge of space. Following that, the craft will make an unpowered glide back to land on a runway. Hundreds of people have put down deposits of two hundred and fifty thousand dollars each to ride SpaceShipTwo which will take off from Spaceport American in New Mexico. Virgin Galactic hopes to begin flights in 2017 and anticipates up to a hundred thousand passengers by 2020. Blue Origins is working on a rocket that will take off vertically to carry a capsule with six passengers on suborbital flights at the edge of space. The Blue Origins craft will land vertically at the launch site after the flight. Blue Origins has already successfully landed the same type of rocket twice. The craft will be launched from a facility in Florida. Details of and schedules for space tourism have not been released. XCOR Aerospace has been working on a rocket plane call the Lynx for years. This rocket plane is intended to be flown multiple times in a day just like a regular airplane. It can only carry one passenger in addition to the pilot. The Lynx will take off from a runway, go straight up sixty miles to the edge of space and then glide back to the runway to land. The company says that it is making steady progress the developing the space plane. The plane has four small light weight engines that burn kerosene as the main fuel. It is a small craft with a wingspan of about thirty feet. The rocket plane is being developed at and will be flown from a facility in Midland, Texas. XCOR claims that more than three hundred and fifty clients have signed up for flights. The price had been a hundred thousand dollars but was raised to one hundred and fifty thousand dollars as of January 1st, 2016. The company has not announced when it will begin flights. A company called World View has a different approach than the other three just mentioned. They plan to use a helium balloon to carry a capsule to about one hundred thousand feet. While the nineteen mile altitude does not qualify as reaching the edge of space, it will still provided a spectacular view of the Earth without the dangers and G forces involved in rocket launches. Unlike the three rocket based systems above which will only provide a few minutes at maximum altitude before returning to Earth, the World View capsule will remain aloft for up to two hours and have a bathroom. The capsule descends when helium is vented from the balloon. At fifty thousand feet, the balloon is released and the capsule glides back to Earth on a "parawing". The company will launch the balloons from Spaceport Tuscon. No date or price has been announced for rides yet. To date, only a few wealthy tourists have paid millions of dollars for a ride to the International Space Station aboard a Russian spacecraft. 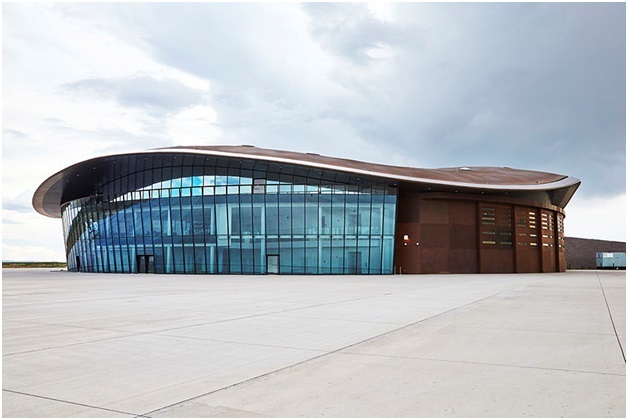 It is hoped that Spaceport American which cost almost a two hundred and fifty million dollars to construct in a remote area of New Mexico will become a center for space tourism. Time will tell whether space tourism is a viable industry or just a fevered dream of space enthusiasts.